Throughput measurements are a cornerstone in any network testing toolbox, designed to stress the capacity and bandwidth of the network. What’s important to remember is that, in order for throughput to carry any real value the network path (number of hops per IP packet) should be minimized. When you want to test the speed of your network and your network alone it is important that the packets never leave the network so that the measurement becomes influenced by a third party, such as an operator or content provider. This case also illustrates one of the challenges MNOs face when it comes to OTT applications. Since the service can originate or terminate outside of the controlled part of the network, guaranteeing performance and control over a quality test is nigh impossible. Content caching and compression are common techniques to enhance fast retrieval of common objects outside the core network. 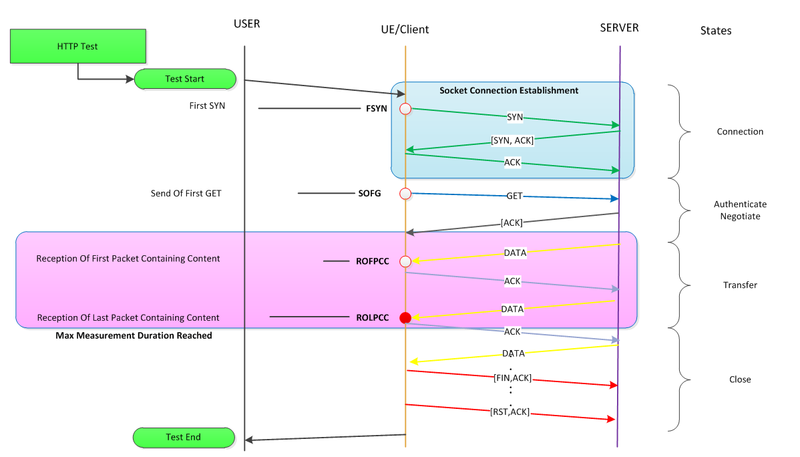 ETSI has standardized throughput measurements for well-known services (HTTP / FTP). It is essential that these KPI’s are used in reporting in order to allow KPI comparison across tools and capture points. There are two main options when doing throughput measurements using file or content transfers. I’d recommend time based measurements for the following reasons. Regardless of complete or time based measurements ETSI defines a series of triggers used to drive the KPI calculation. For IP based measurements these triggers are defined on the packet level. In order to have full compliance with the standard the triggers must be evaluated by deep inspection. Dissecting an IP based test (in this case a HTTP Download) we get the following picture. Note: The ETSI trigger markers are in bold under the UE/Client column. The various stages are not required for all services and could be optional, for example HTTP Download does not usually require authentication. There might as well be additional steps required for other services, the negotiation phase for e-mail is very different from FTP. The session timeout controls the whole activity (HTTP/FTP Download, etc..). While the transfer timeout is triggered only during the data transfer phase. This simplification is set to mimic user behavior. Most applications will use the host OS default values for this. As such an aborted activity due to timeout is therefore an indication that something is not quite right in the network. In case of an activity timeout it is possible to track in which state the service was aborted, the state is tracked as an additional KPI. Complete transfers allow the test to fully complete the transfer. This makes it very easy to estimate the throughput. It is as simple as dividing the file size with the time it took to transfer the file. Presto! It is also possible to achieve high ETSI compliance even without deep packet inspection. ETSI triggers can be transformed to API-level function calls and the delay introduced thereof can be quantified. As such, complete transfers are the preferred way of measuring on hosts that does not allow for deep packet inspection. However, as mentioned previously complete transfers are not suitable for throughput measurements. In my next post I will delve deeper into time-based measurements, the impact of buffers and device performance on KPI measurements.